One of these days, perhaps Kram will genuinely start paying a whole lot more attention a whole lot sooner when I tell him which prospects will not pan out and why. I might say the same thing about at least a few others out there, as well, but, at the end of the day, I get paid the same no matter what, so how much should I really care about who ignores what? Fact is, the only question I ever have to answer is this one: Do I really want to take the time and energy that would be required to formally and/or informally document my (at times controversial) observations and opinions? Personally, as Kram, himself, would be happy to confirm, I am somewhat shocked that Pettersson (5’8″ 192 lbs) has actually stuck around here in North America as long as he has. For starters, European players, by and large, are not famous for their willingness to play third tier hockey in the ECHL. It should be prominently remembered that when the Lehigh Valley Phantoms tried to ship Marcel Noebels to the Reading Royals towards the end of training camp last season, the German national team winger simply signed a new contract with Eisbaeren Berlin and instantly starting pocketing considerably more money as a result. According to the “Elite Prospects” website, who keep careful track of such things, of the 614 players currently staffing the rosters of the 27 teams who play in the ECHL, it would be Pettersson who is the one and only hailing from Sweden — to put things in proper perspective, there are 49 Swedish players currently on the rosters of American Hockey League clubs and a further 69 Swedish players who are presently listed on the rosters of National Hockey League teams. I can certainly appreciate how Pettersson obviously decided to stay and battle his way back up to the AHL level after being assigned to the ECHL’s Reading Royals for the very first time ever in early November of 2015. And the 22-year-old blueliner whom the Philadelphia Flyers chose in the seventh round (# 198 overall) of the 2014 NHL Draft was, indeed, recalled by the Lehigh Valley Phantoms on three separate occasions last season. But Pettersson never did make that much of a positive impression while the impending arrival of Travis Sanheim, the defenseman whom the Flyers took in the first round (# 17 overall) of that same 2014 NHL Draft, as well as the off-season signings of legitimate AHL All-Star caliber rearguards such as T.J. Brennan and Will O’Neill really should have provided more than enough handwriting on the wall. The bottom line, as was noted by this blog in its pre-season roster projections, is that the diminutive Pettersson simply is not physically equipped to be able to win as many battles along the boards, to speak nothing of skirmishes in front of the net, as he needs to be able to in order to compete effectively at the American Hockey League level. The Swedish import is a decent puck mover but definitely not a standout one and, typically speaking, smaller defensemen usually have to do something well in order to compensate for their lack of size. There is no question that Pettersson’s numbers for Reading (four goals and sixteen points from 44 ECHL games this season) just are not all that overwhelming. Enter IF Djurgarden Stockholm, the Swedish elite league club who might very well lose five of the eight defensemen currently on their roster in the summer. Three of the five blueliners will definitely see their existing contracts with IF Djurgarden expire and one of those players, veteran Finnish import Ville Varakas, reportedly has already agreed to return to his homeland and skate for IFK Helsinki next season. The other two players whose contracts run out after this season, Emil Johansson (Boston Bruins) and Adam Ollas Mattsson (Calgary Flames), are low end NHL Draft picks who could just as easily be lured across the Atlantic Ocean the very same way that Pettersson was : the potential opportunity to ultimately earn a massive, seven-figure salary. Two other defensemen are only on loan to IF Djurgarden Stockholm for this season and will probably not return. Linus Hultstrom is almost halfway through a two-year deal with the Florida Panthers and could very well find himself skating in the American Hockey League next term. Alexander Urbom, who skated in 34 NHL games for the New Jersey Devils and Washington Capitals before signing for Russian side Severstal Cherepovets in the summer of 2014, will either have to be returned to AIK Skelleftea or acquired outright by the capital city club. So it only makes sense that IF Djurgarden Stockholm, who are not having a successful campaign and would have missed the Swedish Hockey League’s playoffs entirely if the campaign had concluded yesterday, have already begun to plan for the future. Interestingly enough, it was seventh place IF Djurgarden who knocked tenth place IF Brynas Gavle out of the so-called “play-in” preliminary round of the SHL playoffs a year ago. That particular result enabled IF Brynas winger Oskar Lindblom to join the Lehigh Valley Phantoms for the rest of the 2015/16 term. As for Pettersson, who has a two-way NHL contract with the Philadelphia Flyers organization that has been worth $ 70,000 per season for AHL (and most likely ECHL) service for the past three years, the move back home to the city where he was born will undoubtedly be financially rewarding. It is very hard to find information on individual salaries of players who skate in the Swedish elite league, but it is not so hard to access the annual reports of SHL teams and have a look at actual roster budgets. According to published accounts readily available online, IF Djurgarden Stockholm spent a grand total of $ 4.57 million dollars on player salaries during the 2015/16 season and so, based on a squad numbering 25 players, that would work out to an average of roughly $ 183,000 per player. Of course, some players make more money than others; the very best players in Sweden are thought to earn around $ 400,000 per season and it was not all that long ago that former AHLer Linus Klasen (who now earns his living with HC Lugano in Switzerland) signed a three-year contract with IF Malmo that paid an eye-opening $ 600,000 per season. According to a published report, the salary of a de facto average player in the Swedish elite league during the 2012/13 season was anywhere between 75,000 to 90,000 Swedish crowns per month. Based on a pay period of a nine-month season and converted into US dollars using the exchange rate that existed back in 2013 (1 Swedish krona = 0.16 US dollars), the compensation for the de facto average player in the SHL that season works out to a range of between $ 108,000 to $ 129,600 per year. And, if anything, the total revenue of Swedish hockey clubs from all streams such as television, advertising, ticket sales, and participation in the Champions Hockey League, etc., has been steadily increasing in recent seasons so player salaries certainly have not been in decline. Let the record show that I first heard dE predict the European return of Pettersson sometime near the end of the 2014-2015 inaugural season. I was paying attention there. And, I had no reason to disagree as the dE knowledge base on European Hockey is much greater than any other individual I have ever met. Certainly, when Petty was relegated to Reading last season I thought the dE prediction might come true right then and there. Now, the fact that I kinda like the kid and recognize his underdog status, dedication, and hard work does not mean I ever believed he’d make any kind of run at the NHL. I, too, am and was shocked that he’d toil in “baseballtown” for so long when home-town opportunities might not only be available, but pay more as well. I believe when I’ve written about the “diminutive defenceman” in the past, it has been with that slant: A player I personally really like, but understand is not an All Star or even much of an NHL prospect despite his 7th-round draft status. 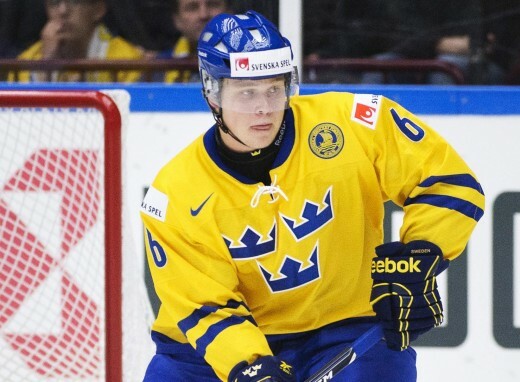 Pettersson also holds a special place in my fandom because he was the first player–baseball or hockey–where I realized my own age–just looking at the day he was born and realizing where I was and what I was doing on that day: 7/16/1994. But we do try to tell it like it is around here, where possible. dE is more than capable of writing his own controversial opinions when he has the time and inclination. And, he’ll do it and back it up with evidence better than I could by just writing some kind of controversial “hot take” and attributing it to him (or myself as the case may very well be from time to time.) I’ve got a post coming out later today or tomorrow expressing my own frustration with this team–and we’ll see where that takes us. And I look forward to future dE posts about “prospects” like Konecny, Morin, Lindblom, Rubtsov et al–as well as his opinions on Hextall and the Flyers management.